A very interesting and intriguing fact about this place is that, vehicles are strictly prohibited inside the limits of Matheran. This little fact makes the place more picturesque and almost takes us back in time with all its horseback riders and hand pulled carts. The clean, uncluttered place with its cool and soothing air invite us, while the grandeur and brilliance of the views that are abundant here enthrall us. 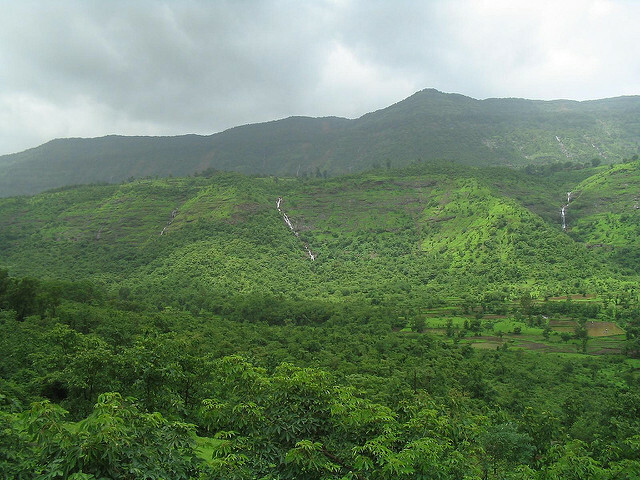 Matheran can satisfy the desire of all kinds of travellers. Adventure junkies could enjoy treks Chanderi caves, Kalavatin Pinnacle Trek or Ishalgad fort. They can also enjoy water rappelling at Dodhani Waterfalls or Rock climbing at Louisa Point, Alexander Point, Prabal Fort or Shivaji’s Ladder. You could picnic along Charlotte Lake, while bird watching and also visit the ancient Pisharnath Mahadev Temple. You can also enjoy the beautiful Vistas of Matheran from viewing points like the Louisa Point, the Echo Point, and the monkey point. At 2636 feet above sea level overlooking the mountainous terrain along with sweeping plains, there are more than 38 perfect places to visit in Matheran and enjoy the beauty of the nature. The toy train ride from Neral to Matheran station is yet another enjoyable experience. If you are driving to Matheran you need to park your cars at around Dasturi and hire a horse or man pulled rickshaw or better yet take a walk. Matheran is a walker’s paradise. Walking is a pleasure in its uncluttered roads and overgrown passages of trekking trails that lead you to various scenic spots. Many trekkers prefer walking to Matheran from Neral with a tremendous amount of scenic beauty to be enjoyed on the way. But be warned about the notorious monkeys of the region who are as famous as the place itself. History buffs could visit the Ambarnath Shiv Temple located 37 kilometers from the hill station and situated along the Waldhuni River.It is believed that the temple was constructed by King Mahamandaleshwar in 1060 AD as a memoir of his dynasty and a tribute to his ancestors. Another must do activity while in Matheran is the unique ‘valley crossing’ where in you cross a valley from one phase to another, distance of about 900ft approximately just by hanging on a rope above an abyssal looking valley. An immensely enjoyable ride as it is, this is certainly not for the faint hearted. If you are looking for a short vacation to wind up your stress, freshen up your body and liven up your spirits, Matheran with its taintless perfection and invigorating freshness and its numerous scenic spots is the perfect choice. If you are visiting Matheran then you should also watch the breath-taking Sunset that can be seen from Porcupine point and take a ride along the toy train.